Woke up to another rainy and cold day. My brother was showing all the classic symptoms of a cold. I tried to motivate him by telling him that weather in Italy looked much better and dry. I am not sure that it helped at all. He was too weak to insist on having breakfast this time around, so we got going right away. 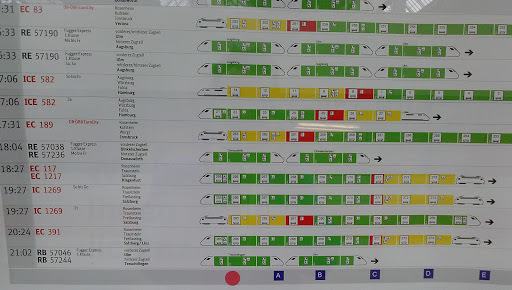 We first had to travel to Heidelberg to get onto the Munich train. Although Heidelberg wasn’t too far to cycle, we did not want to spend another minute in the miserable weather and opted for a small commuter train. After purchasing our tickets, we hurried towards our train that was already on the platform. 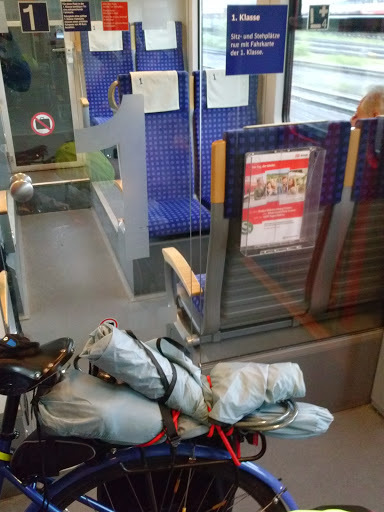 Prior to boarding, we removed our rear panniers from the bikes fearing that they wouldn’t fit through the train doors. 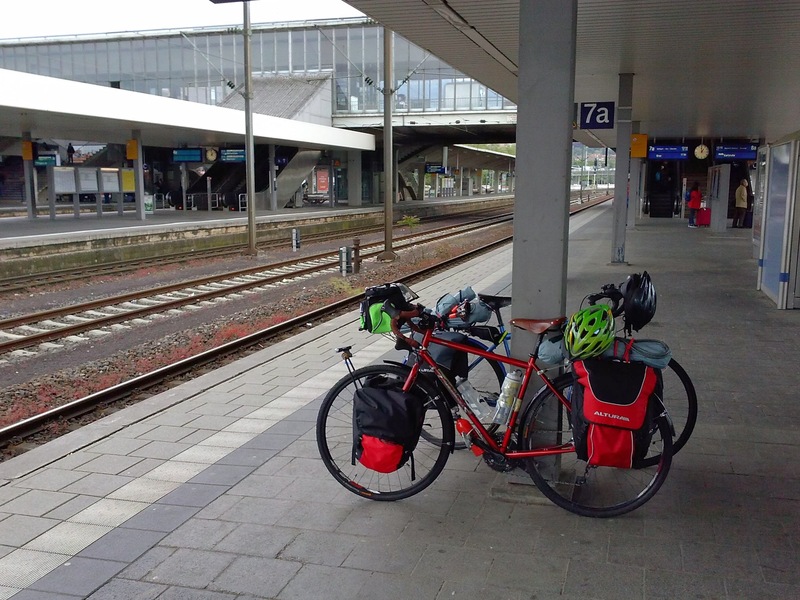 We hastily loaded up the bikes and then the panniers separately onto the train. Once the train doors closed, we realized that we boarded a 1st Class car. We didn’t feel like changing cars as it was a very short ride. No else seemed to mind either as it was past the morning rush hour. Once we picked up our tickets at Heidelberg station, we had a two hour wait so we decided to explore the town a bit despite the freezing cold weather. However, after a few blocks of riding around, we decided to return back to relatively warm train station for some food. For both legs of the journey we used intercity express trains (ICE). These trains crisscross much of the country and are quite fast with speeds up to 200 km/h. You don’t really get a sense how fast you are travelling until you encounter another train travelling in the opposite direction on the parallel tracks. The noise is quite disturbing because of the air pressure created by the two passing trains. However, these trains are quite comfortable with plenty of space to stretch your legs. There is also a cafe car on each train. The impression we got was that Germans are quite strict in general. This strictness is reflected on their precision of doing things. Their trains and railroad systems are no exception. They are almost always on time and well organized. There are signs on the train station platforms showing precisely where the train will stop and where each specific car is located. We used these signs to easily locate our bicycle cars on both legs of the journey. Bicycle cars are divided in two halves: one half is for the bicycles and the other for the riders. A glass panel with a door separates the two so your gear is always within sight. Both halves require reserved ticketing. 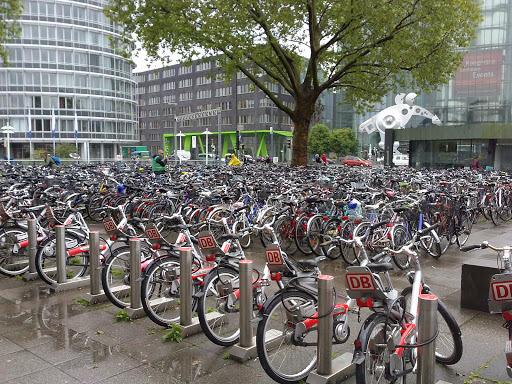 However, on the first leg of the journey, some other couple had used our bicycle racks, so we ended up doing the same. 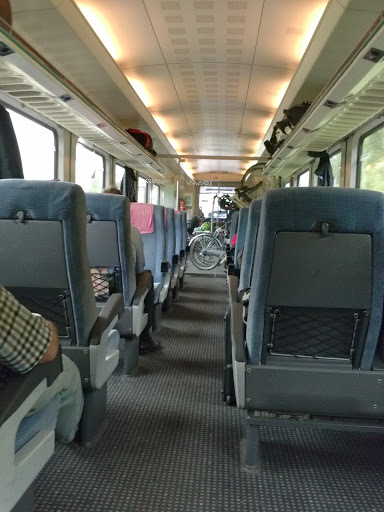 The ride to Munich was uneventful and quite relaxing. Munich train terminal was really large and full of restaurants and shops. It was like an large airport terminal in the middle of the city, but better. One hour layover we had in Munich gave us a chance to grab something to eat and explorer the terminal a bit. Afterwards, we got onto train that would take us to Villach, Austria. It was nice to get a peak of the Alps as we approached Austria. 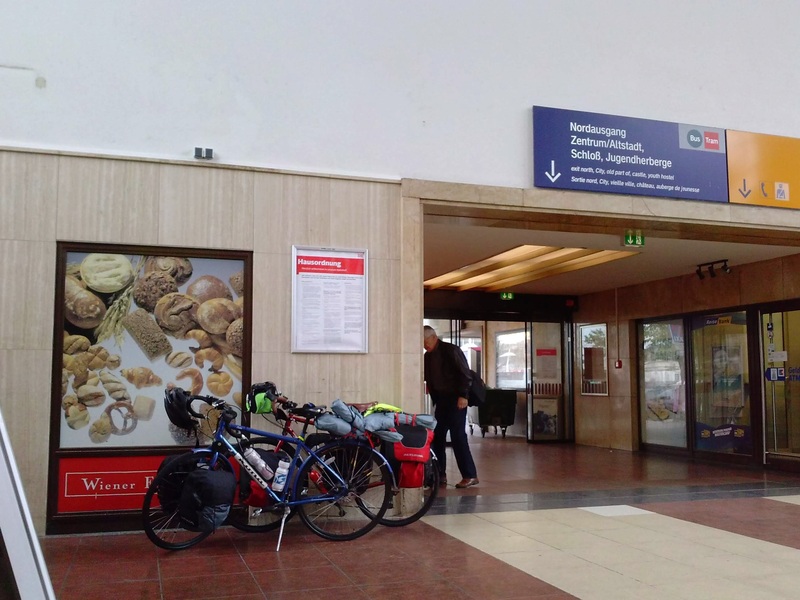 Once we crossed the border, the train stopped at the Salzburg station for about 15 minutes. During the delay, an Austrian crew came on board to replace the German one. I am not sure whether they had substituted the engines as well. Salzburg looked cold and uninviting from our train windows. It was hard to believe that this was the very city that motivated the likes of Mozart and Haydn to create such masterpieces. The train took of once again following a welcome announcement from the Austrian crew. It followed the foot hills for a bit before turning into a deep valley that cut through the Alps. I am sure that the scenery was fantastic, but it was too dark to see anything by then. We finally arrived in Villach sometime between 9 and 10 PM at night. I had made reservation the night before at a hotel called Goldenes Lamm. That was the only thing I could find (?) with OK reviews. Once we left Germany, we knew that we wouldn’t have 3G coverage. So we started caching the map areas we anticipated to travel the next day on my phone. That is how we navigated the rest of the route. The hotel was already marked on my map. We got on our bikes rode there in no time. We arrived to the hotel around 10:30PM. It was an old multiple story building. The lobby was was dim but charming. An old man sat behind the checking counter. He was welcoming but we could tell he was in a hurry to check us in. We could tell from the alcohol odor in his breath that he was ready to call it a day. He showed us where we could lock our bikes in the hotel’s garage and handed us the keys to the room. We were quite disappointed with the rooms. They were dark and outdated. The floor boards creaked as you walked on them. The beds were no better either. Everything we could have easily overlooked (and usually would have) if it wasn’t for the fact that we were charged 150+ Euros for the room.